It’s a Minion Overload in Koalakrane Machines! HomeIt’s a Minion Overload in Koalakrane Machines! There’s an amazing surprise coming to Koalakrane machines—and they’re yellow, pill-shaped, and just irresistibly cute! Your all-time favourite henchmen are back with a bang, and this time, they’re tagging along with their beloved masters! Test your skill on Koalakrane claw machines and win eight different Minions, including Gru, Edith, Agnes, Margo, and Agnes’ favourite Unicorn plushie! Inspired by the characters of the upcoming Despicable Me 3 movie, these premium snuggly plush toys are stitched with high quality plush fabric and soft fibre filling, making them completely safe for kids from ages 3 and above! 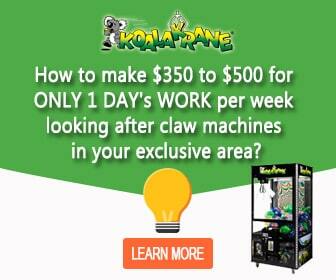 Challenge yourself and your friends to win a minion from a Koalakrane machine. Head on to your nearest Koalakrane to try your hand at winning one of these Despicable Me 3 plush toys!